I accepted the invitation to review ‘Life Stories’ with a mixture of curiosity and apprehension. Not a fan of traditional opera – because I usually find the acting disappointing, the music overblown and the storylines too protracted – I wanted to see if this was something I could engage with. And it turned out to be one of the most intriguing and entertaining performances I’ve ever experienced. Here I need to make two confessions. Firstly I know very little about opera and classical music. I know what I like but I know nothing about the technical side of the production. So if you’re looking for a detailed analysis of the musical content this isn’t going to be your sort of review. However if enthusiasm for the overall impact of the event is your kind of thing, then please do read on. My second confession is that I got a flat tyre on the way to the theatre. Which meant abandoning the car and taking a bus. And having the awkward experience of turning up 20 minutes into the first act with no programme and very little idea of what was going on. However I had read just enough online to understand that this was an opera made up of two acts, each telling a different story, separated by 300 years. With a linking theme – to be revealed during the performances. Settling as quietly as possible in my front row seat I was struck by the immediacy of the opera in flow. This Act – called ‘Rest in Peace’ tells the story of am elderly homeless man, in the last hour of his life. He rummages through his possessions, connecting objects he finds with the events from his past. The stage is equally divided between the chamber orchestra on the left – and the singer on the right. The ‘scenery is simple but effective – a painted crumbling red brick wall, with one of those iconic Russian posters of rosy cheeked peasant families holding their offspring up to the sunlight, a shopping trolley full of rubbish (or so it seems), and a filthy sleeping bag. However what really impresses me is the smoothness of connection between all the elements for this performance. Fisher as Ezdeyev wanders across the stage and leers over the female violin player before returning to the stage to drag a tattered ‘girly mag’ in his shopping trolly, and pleasures himself behind it. Finding only an empty sherry bottle among his own possessions, he grabs the champagne bottle open at the conductor’s feet, causing the conductor to halt the music while he remonstrates with the character. Ezdeyev picks up a deck of cards and scatters it across the stage or stalks up to the players, beseeching them to ‘lend me five roubles’ or the conductor to ‘lend me a dinner jacket’, while the orchestra play on clearly aware but un-dettered, the music always so conscious of the tale unfolding – reflecting it, enhancing and enriching it – but somehow also as coolly disconnected as the passer-by who spots a vagrant on the street and looks the other way. When the dying Ezdeyev finally sinks to the stage and pulls a sheet of cardboard over him, it is the conductor who steps across and pulls it off him, so Fisher can be resurrected to receive the rapturous applause of the audience. Several people are shouting bravo and as we file out for drinks in the auditorium I overheard various audience members saying how impressed they are. ‘I work in a soup kitchen and that was so realistic – really captured the feel,’ is one of the comments that strike me. Here I should mention that LIFE STORIES premiered at the Royal Northern College of Music, Manchester, on 1st July 2015, before embarking on a tour of the north-west, taking in Preston, Halifax, and Todmorden, followed by an acclaimed run of performances at London’s prestigious festival of contemporary opera, Tête-à-Tête: The Opera Festival. 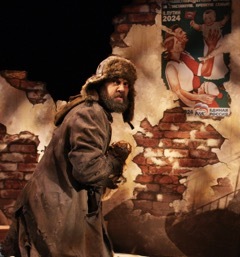 During the interval I manage a chat with the writer, Tim Benjamin, who explains that the first act was inspired both by Chekhov and by a childhood experience of observing a homeless man in the soup kitchen where his mother volunteered. This act was written first and he explains that the second act, which he wrote with Anthony Peter, will link with the first – but he’s leaving it for me to find the link for myself. The stage is almost in darkness and the small chamber orchestra is still occupying the right hand side. The wall is now posterless and there’s a straw pallet in front of it. There are a few rough items of furniture and a small chest. There’s a commotion at the back of the theatre and a figure swathed in ten-gallon boots, a muddy but substantial greatcoat and a tricorn hat, stumbles down the stairs and onto the stage. My programme has previously told me this is ‘Silent Jack’ and this is the secret cellar of an English estate in 1724. Highwayman Jack reveals herself as Amy Beddoes, a formerly prosperous gentlewoman who has fallen on hard times. Played and sung very convincingly by mezzo-soprano, Taylor Wilson, we are introduced to both the ‘swagger’ of the highwayman’s life and the bitterness of a woman who has lost her fortune and the love of her life. The hedonistic and money-oriented Amy has seen her war-hero husband, James squandered his money on stock market shares, before leaving her destitute, as he ran off with a servant. A number of times we see ‘Silent Jack’ acknowledge some discomfort in her side, but each time our fiesty heroine distracts herself with her own bravado – until towards the end we discover that she has been shot and is dying. You might have guessed the dying bit, but it would be a shame to give away the cruel and dramatic twist that led to this – and you can listen to the whole performance on the CD which is now available. Needless to say, Wilson sings her death with consummate skills, that is never overblown but always gripping. Oh – and the link between both acts – apart from the obvious one of both characters being in their last hours was a very beautiful verse asking ‘Where are they now, the snows of yester year?’ which both characters sing ; coming late in Ezdeyev’s story and early in Amy/Silent Jack’s. But as with all aspects of this work, themes reoccur but are never laboured – creating familiarity rather than the repetition that can be irritating in some operas. Last but not least I want to mention that this wonderful opera was the product of a company born in Todmorden, and the musicians are from Manchester, Huddersfield and surrounding areas. It’s apparently the last performance for ‘Life Stories’ but based on my experience I would highly recommend that you look out for the next production by Radius. ‘Life Stories’ is now available on CD and digital download / streaming.